Happy New Year everyone! Now, a lot has happened since September last year. Micro Mini Basu, a little boy, arrived on 29 October 2010. I thought motherhood the first time was difficult. But a quick look back reveals those were the good days - I was still doing my nails! Manicures are the last thing on the mind right now. I'm the mom of two under two. That's a lot of nappies, tears and youth rejuvenating serum. Still, I'm happy to report Micro Mini me is divine and angelic. God knows where he gets that from! Mini Basu, on the other hand, is shaping into a fiesty princess with a penchant for flouncy frocks. (Now, where did she get that from?!) And that I am still sampling the delights of wintry London, with the aid of a lovely Gujarati lady, albeit a little bleary eyed. As for quick Indian cooking. Did I even know that meaning of "quick" before I had two kids? During the day, quick means whatever I can rustle up while Mini Basu terrorises soft toys or hangs off my skinny jeans, and Micro Mini gets his beauty sleep. In the evenings, it's a real toss up between cooking and sleeping. Sleeping usually wins. Makes the 50-slide presentations I put together at work seem easy peasy! There would be no better to restart this blog than with another version of Dhaniya Murgh, or Coriander Chicken Curry, the perfect recipe for the exhausted on a quiet evening. 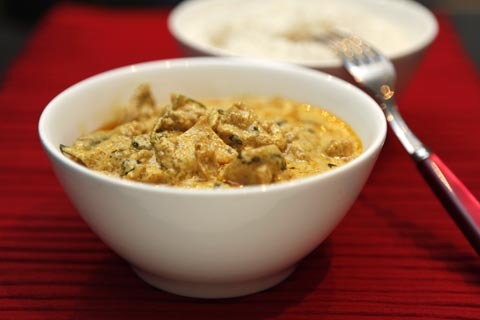 This creamy yet low fat chicken curry is steeped in two of my favourite ingredients - coriander and yoghurt. This version has more curry and cooks quicker with the boneless chicken thighs. Here's to everything bigger, better and quicker in 2011. Happy New Year everyone! Take the yoghurt out of the fridge. Roughly chop the onion and finely mince of puree the garlic ginger. Cube the chicken into bite-sized pieces. In a medium-sized pan, bring the oil to heat on high. When it starts sizzling, add the onions, ginger and garlic and fry until the mixture is golden brown. TheÂ stir in the all the powders apart from the garam masala. Fry the masalas for five minutes, adding a serving spoon of hot water if they start getting stuck to the bottom of the pan. Then mix in the chicken and seal on the high heat for about two minutes. Next, spoon in the yoghurt, lower the heat to medium low and cook, stirring regularly for about 10 minutes until the chicken is cooked and oil floats to the surface of the curry. Finally stir in the coriander, garam masala and salt to your taste. Serve piping hot with freshly-made Basmati rice. Happy New Year! I am in awe of you and every other mother out there, Mallika. Amazing to “see” you Mallika! Congratulations on bringing another angel into this world! So happy for you! If only I could bring one into the world in 2011! Happy New Year to you and yours! Love the new design! This dish looks, and sounds, fantastic. I can’t believe you still have the time even to make this kind of a dish with two children. Bravo to you! Happy New Year! I’ve been meaning to mail and tell you but I’ll just tell you here – I finally found your book (after three attempts) and bought it – having fun reading it. Happy New Year! dear Mallika. Congratulations! a few times. You have a lot of action in 2010 and here’s wishing you a great 2011. I’ve been reading your blog for a couple of months and i love it ! I also just bought your book on amazon – can’t wait til I get it ! I’m a novice to the kitchen and your recipes are so quick and easy and explained well. I’m going to try the Dhaniya Murgh tonight, wish me luck! Congratulations and glad to see you back with some recipes! Could do with some new inspiration this year – good luck with the two little ones! So totally cool! Happy New Year! Thanks for the super fast curry! Hey I really love your take on Indian food. This recipe is really great. I just came across your site and your recipes look delicious! I was just wondering if it’s ok to substitute the Greek yogurt with coconut milk? Thanks so much everyone… It feels lovely to be back and it’s all thanks to the words of encouragement! Hi Sophiya – sounds like a great idea! You may need to add ginger too when you add the garlic just to lift the coconut milk… experiment away! Congratulations on your beautiful family! I had a 2 year old and then b/g twins so I understand. It was survival mode for at least the first 6 months! You will get through it and once the baby is in a routine you will find you have more time to pursue your own interests again! Wow! A girl and now a boy make your family complete. I’m so happy for you Mallika. Congratulations! love your blog and website Mallika and your recipes. 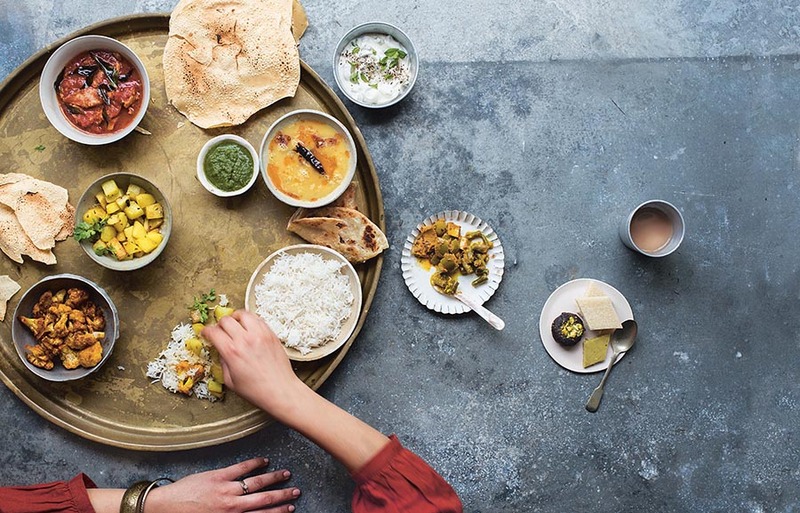 I just adore indian food every night of the week and your vegetarian recipes are awesome, already tried 2 and love reading your blogs. cant wait to return to the UK again this year! Great recipe! I just made your coriander chicken today and it turned out fantastic! Thanks so much for the recipe. I made this tonight for my fiance and we both loved it! Deeeelicious and easy! interesting recipe…i will try and let you know how it comes out.. I stumbled across your website and tried out this recipe. My 3 yr old daughter loves the coriander chicken curry, she keeps asking for it. I cook this once a week now and it’s her favourite! Thanks! Yesterday, I was looking to cook something different with chicken. Dhania caught my attention. The recipe seemed simple enough with the ingredients that we usually have at home. I immediately cooked, sure enough, it was great success. Will try some of your other recipes in the coming weeks. Thanks for sharing your recipes! As a new graduate student, I was attempting to cook chicken for the first time by myself and was looking for a simple yet flavourful recipe that takes minimal cooking time. Your recipe and cooking instructions made the process a breeze and me and my flatmate are not able to stop eating, it’s come out beautifully! Thank you so very much! Finding your website has been like uncovering a treasure trove, looking forward to trying more of these recipes out!